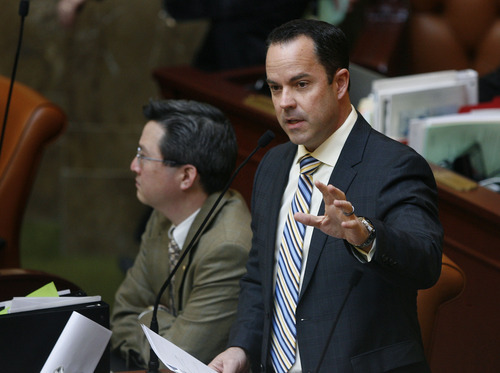 Stalemate between Utah Senate, House over prison privatization? Legislature • Prison-relocation bill bounces between Senate, House as legislators disagree over amendment. 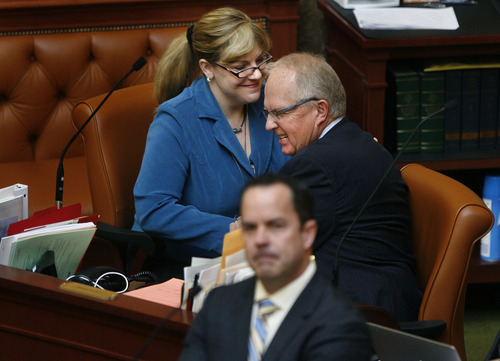 Scott Sommerdorf | The Salt Lake Tribune Rep. Jennifer Seelig, D-Salt Lake City, left, and Rep. Mike Noel, R-Kanab, congratulate one another on stripping a prison privatization provision from HB72S6 -- the Prison Relocation and Development Amendments. In the foreground is Rep. Brad Wilson, R-Kaysville, floor sponsor of the bill. Scott Sommerdorf | The Salt Lake Tribune Rep. Brad Wilson, R-Kaysville, speaks to his bill - HB72S6 - Prison Relocation and Development Amendments - in the Utah House of Representatives, Wednesday, March 13, 2013. He was not happy with an amendment that passed preventing private companies from submitting plans to run the prison. Scott Sommerdorf | The Salt Lake Tribune Rep. Mike Noel, R-Kanab, proposes an amendment to HB72 - Prison Relocation and Development Amendments - that would prevent the new prison from being run by a private company. The amendment passed with the support of Minority leader Rep. Jennifer Seelig, D-Salt Lake City, in the Utah House of Representatives, Wednesday, March 13, 2013. 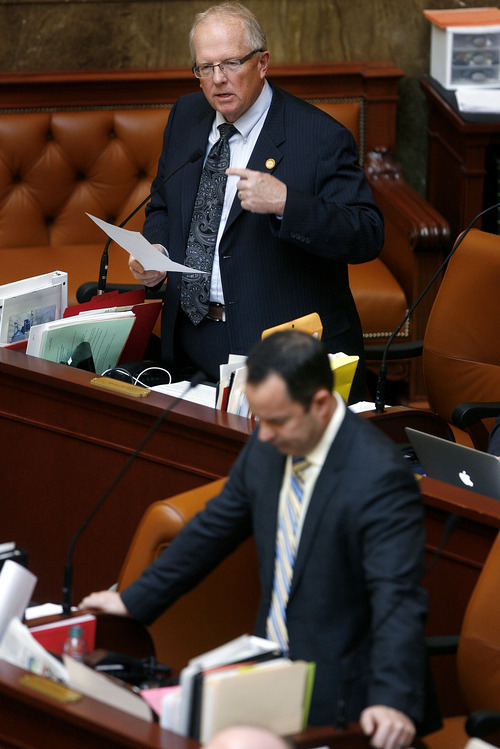 Rep. Brad Wilson, R-Kaysville, listens, below, as Noel speaks about the amendment that Wilson opposed. House and Senate lawmakers were at odds late Wednesday over whether to allow a prison relocation authority to consider proposals to turn a new prison&apos;s programs and operation over to private contractors and the bill continues to be in flux. The House will get a first shot at considering the seventh version of SB72 this morning after a bi-partisan conference committee voted 5-1 Wednesday night to once again make privatization proposals an option. "My opinion here is I just don&apos;t want to jump to conclusions," said Sen. Scott Jenkins, R-Plain City, and a sponsor of the bill. "Everybody says, &apos;does that mean you&apos;re going to privatize the prison?&apos; No, but I want to have the most options." In addition to Jenkins, Sen. Steve Urquhart, R-St. George, and Sen. Gene Davis, D-Salt Lake City, participated in the late-night parlay. The House sent Rep. Brad Wilson, R-Kaysville and a bill sponsor; Rep. Greg Hughes, R-Draper, and Rep. Lynn N. Hemingway, D-Holladay. Hemingway was the lone nay vote and said he thought the House would be unlikely to accept the bill with privatization as an option, which he said is opposed by county sheriffs and law enforcement. "I don&apos;t know where it hurts to hear it," Jenkins responded. Four of the six entities that expressed preliminary interest in the project have experience operating or partnering with government entities in operating prisons. According to Wilson, two are interested in building the prison and leasing the facility back to the state. Rep. Mike Noel, R-Kanab, proposed the amendment striking language from the bill that authorized the Prison Relocation and Development Authority (PRADA) to seek proposals from private contractors for programming, operation or both at a new prison. "This is not about making profits on individuals in our system," Noel said, later adding, "it&apos;s about the dignity, that we respect human dignity." Noel quoted from a study that found private prisons typically did not deliver promised cost savings or improved quality. But more important, he said, was avoiding turning inmates into commodities  which he said happens when prisons are privatized. Wilson said the amendment would "tie" PRADA&apos;s hands as it considers proposals, but that argument fell flat in the House earlier Wednesday. Both Senate President Wayne Niederhauser, R-Sandy, and Senate Majority Leader Ralph Okerlund, R-Monroe, said earlier Wednesday that privatization proposals should get an airing. "I&apos;m not saying privatization is the best option … but we ought to look at every option  what&apos;s best for the taxpayer, what&apos;s best for Utah," Niederauser said. "We&apos;ll have some discussion on that when it comes over for concurrence." The House voted 51-20 in favor of the amended bill on Wednesday. Speaker Becky Lockhart, R-Provo, who had previously expressed reservations about how quickly the bill was moving, was among the yeas. The current version strengthens both the governor&apos;s hand in the process and the bill&apos;s conflict of interest provisions. Wilson emphasized that the bill does not authorize relocation of the prison, but merely empowers the PRADA board to "step further" down the road in seeing if the project is economically feasible. The governor and Legislature would still have to sign off on any proposals the board recommends. PRADA has estimated the cost of a new prison at $550 million to $600 million, although previous estimates have put the price tag close to $1 billion. The revised bill would allow Gov. Gary Herbert to appoint six of the 11 members of the PRADA board. It also requires the governor&apos;s "written approval" on requests for proposals to move the current Utah State Prison or tear down the old facility, and plans to redevelop the 690-acres the facility now occupies. Leaders of the Senate and House would each propose two members; Draper city, where the prison is now located, would have the last seat. Wilson called on his colleagues to engage in "big thinking" for the future. He noted many facilities at the Utah State Prison are antiquated and do not lend themselves to programming needs for aging inmates, recidivism and safety of both inmates and staff. He said now was the time to act given low interest rates, construction costs and attractiveness of the current site as an economic center for the state. "It&apos;s a tremendous opportunity for us," he said. The Governor&apos;s Office of Economic Development has estimated that the current prison site could attract developments that would create up to 40,000 jobs and $20 billion in economic revenue over 25 years. But Rep. Mark A. Wheatley, D-Murray, questioned those projections as "too good to be true." "This piece of property  it sounds like it&apos;s made of gold," he said. The House tacked on an amendment by Rep. Patrice Arent, D-Millcreek, to ensure hearings to allow public input as PRADA solicits and vets proposals. Noel also questioned whether the conflict provision would bar a representative of the Utah Association of Counties from serving as a PRADA board member. The substitute bill bars anyone who is an "officer" of an entity that has a direct or indirect interest in the project  language that could be interpreted to apply to any local governmental entity, Noel said.